I drove to Palm Springs in about an hour and a half. As soon as I got there we got ready to go out. The plan was Mexican food, margaritas and dancing. We went to a cute Mexican place called Las Consuelas. There are a couple of them in the area. I had a bunch of chips and salsa while waiting for the food. The salsa was really good. I ordered the fajita salad. 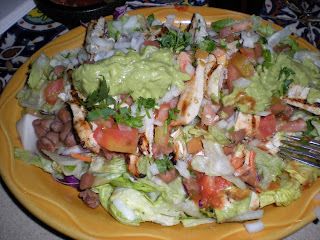 It had chicken, beans, guacamole and a ton of lettuce. I left a little of the chicken and beans because I got full quickly from the chips. I can’t eat and drink alcohol at the same time so I just ordered a diet coke. The margaritas are so big though after we were done eating one of the girls couldn’t finish her big ol’ margarita so I had to. I probably drank a tiny bit more than is pictured.We refuse to leave any tequila on the table! At the club I had a grey goose and cranberry, a shot of something I don’t want to name and another novelty shot from those shooter people that walk around. This is the only pic I got of the drinks though. 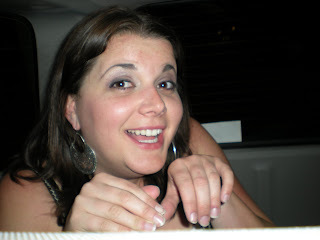 This is Lisa doing an impression of a puppy. She makes a cute puppy. I am sure she will get adopted. We danced for hours, so when we got back to the condo a brownie seemed like a good idea. That is the bad thing about being up and out so late, you want to eat again! 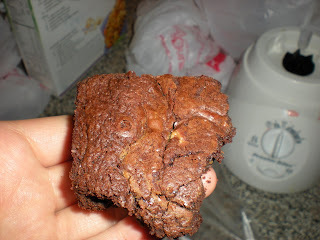 These brownies were killer. Lisa made them from some Barefoot Contessa recipe. They had a pound of butter and I think a pound of chocolate chips. I knew that and I still had one. Hell-o Monica! Get it together. 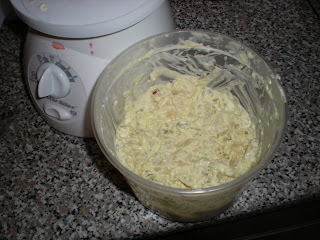 Then, Lisa was snacking on some potato salad and I stole the container from her to take a couple of bites. Again, it was just tired eating. Boo.